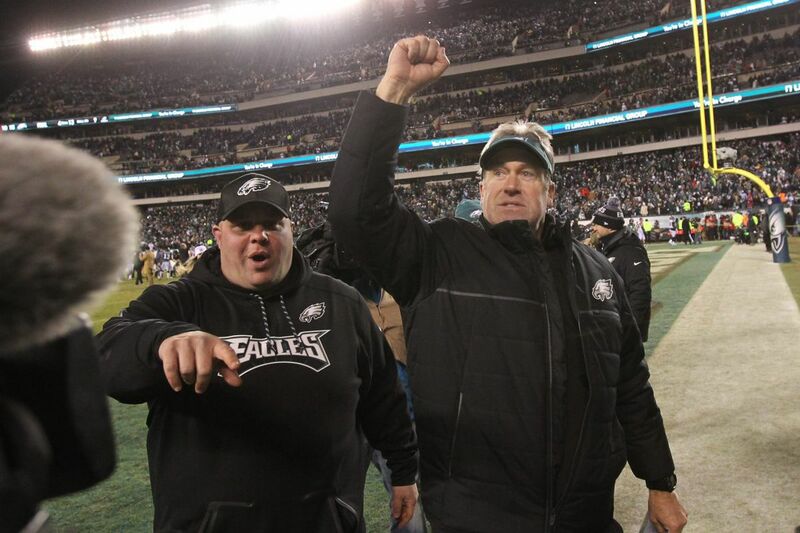 Philadelphia Eagles head coach Doug Pederson salutes the fans at Lincoln Financial Field after the Eagles’ 15-10 playoff win over the Atlanta Falcons. Everything kind of rushes through your mind, but the biggest emotion for me was I was with the team. The guys, the resiliency of this football team. And you know, our backs against the wall, people discount us, don't give us much credit, whatever it might be. And for our team to battle against a fine football team, a team that obviously at this time of year is playing extremely well, a hot football team, that's one thing about this team that I love so much. They battle to the end. So that was the biggest kind of rush of emotion, just thinking about the players. Nick is Nick. That's what we've talked about, and that's what he and I have talked about. We stayed committed to the run, obviously, and that helps. And then with the passing game just him making great decisions, you know, and getting the ball out of his hand, finding the open receiver. He did a really nice job executing the game plan how we, and how I, know Nick can. I was really considering that, going for it. I really felt like at that time, if we do make it – obviously, the kick, you're up five, and you're putting it back in your defense's hands, which is a positive because I felt like they were playing extremely well at that time. But I also knew if we do go for it and make it at that point, the game could be over at that time. But I elected to take the timeout, talk about it a little bit more, and then just ultimately kick the field goal. It's a play that we've actually had in our arsenal. We've had it up in game plans before this season, just never got to it. We were in the right situation — I believe it was a third down when we called it — and it was just the right time. We had been running the same play with our running backs, the exact same play, with Jay [Ajayi] and LeGarrette [Blount] earlier in the game. This was just an opportunity for Nellie, to put it in his hands with Lane [Johnson] as a puller, and we executed it extremely well.